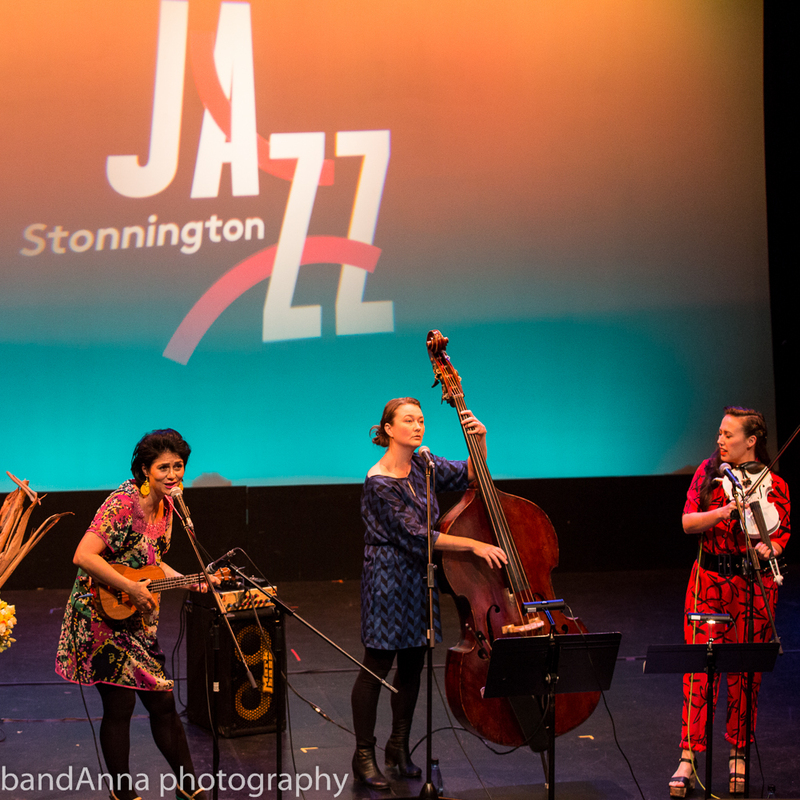 A song about changes, possibly a foreshadow of the new world that TIGGY have invented kicked off the night in the Williamson theatre at the Stonnington Jazz Festival. The trio on stage comprised of three luminary talents. Singer and piano player Monique DiMattina – she prefers piano player to pianist- (also doubling on ukelele and melodica), double bass player Tamara Murphy and singer/ violinist/ force of nature Fem Belling set out to give unique interpretations of an array of songs mostly associated with other genres. Not exclusively; the set list included some of their own songs as well, compositions born at other times, at other places, possibly before they had even met. It was a high-energy performance, one that had your feet tickling and wanting to burst into swing-dancing or, at times, making your soul let go and follow the smooth flow of notes. Just what one needs on a rainy night in Melbourne; three extremely talented performers, swapping instruments with remarkable ease, uniting their voices in song and encouraging the audience to keep the tempo of a song with clapping, thumping and finger-snapping. The songs were very carefully chosen, the lyrics telling their own stories and revealing the issues that have these artists concerned; from environmental tragedies to love tragedies. An interesting, velvety rendition of the Talking Heads’ ‘Psycho Killer’ twisted my brain a bit, with its unexpected changes to the well-known ‘fa fa fa fa fa’ rhythm…. As for Fem Belling’s swing version of Eminem’s ‘Lose Yourself’, it was one of the highlights of the concert, almost literally, making a strong case for losing yourself and starting to dance, to sing, to swing! Due to the lack of space though, I had to compromise to tapping my feet (an art form that all jazz listeners are familiar with). The tune that touched me the most was performed in a language foreign to me, but the melody and the passion in Fem’s voice clearly indicated that it was about love. And about love it was. It was ‘I love you my angel’, sung in Swahili. And, it just might be that dazzling songs like this one, is the glue that connects talented performers and audiences and – dare I say – the whole world!